This beautiful sunny groundfloor studio/1 bed flat (55 sq. meters) has been totally refurbished in 2015. 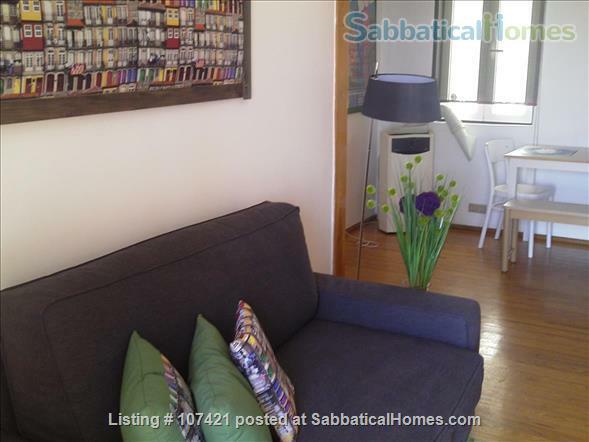 The studio is located in Alfama - at the heart of Lisbon's old city. You have your own patio to soak up the sun! House has wifi. This brand new flat/ studio has been totally refurbished in 2015. It is located on the ground floor (no stairs!). The flat is an airy bright open space with two private patios. There is a fully equipped kitchen and a brand new toilet/shower room. The flat is tastefully decorated and you have access to free wifi. The flat is very quiet and within walking distance to all local amenities. You will have access to the entire flat as well as your own private two patios. You will have your own entrance to the building. There are lots of nice shops around (such as ice-cream and wine shops) and the tram is just outside the door. We live just around the corner and will be happy to offer recommendations and help you with any queries/ problems. Alfama is one of the oldest and most typical neighbourhoods of Lisbon. You will be within walking distance to the castle and the cathedral and there are lots of typical restaurants and bars in the neighbourhood. I'm originally from Lisbon and love the light the city has to offer and its' hidden gems. I have lived in London since 2003. I originally came to study and have worked as an arts producer/ fundraiser for the last 8 years. I have run a number of international projects with young people that have taken me to places like China, Indonesia and Poland. I love finding new places to eat and exploring the less known areas of the city. My mum (Isabel) will be your local contact when you get to Lisbon. She is a history teacher with heaps of knowledge on the city. She lives just around the corner from the flat and will be happy to help with anything. I am always happy to help and answer any of your queries and give you recommendations of things to do.